We went to the amulet market today, I was hoping to find some magical amulet with +int +stam, and +spell damage but no such luck. 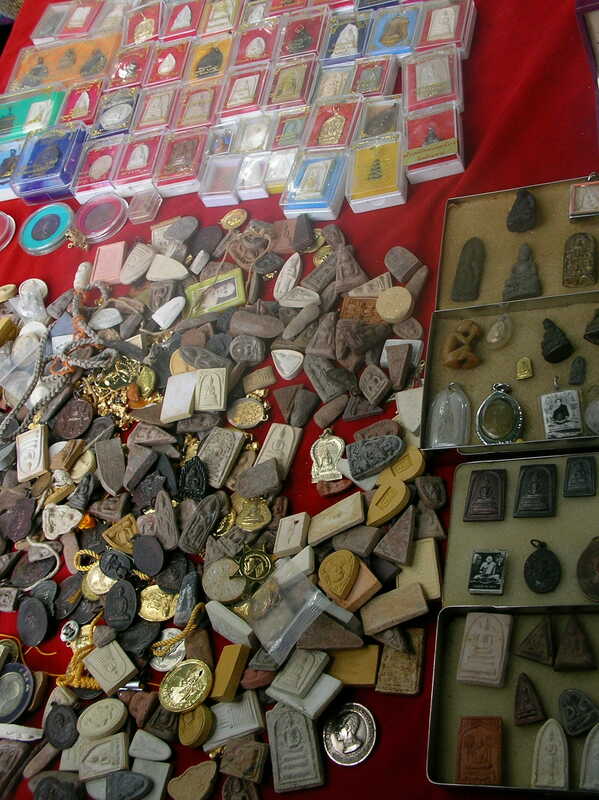 There were thousands of ‘lucky’ amulets but I was skeptical as to how much luck they would actually provide, there were also many amulets made of ivory (can’t bring those back thanks to CITES… but that is a good thing). The market was very interesting to see, and it was interesting to learn that most Thais carry at least one ‘lucky amulet with them at all times. I’m going to thailand on the 3rd week of december. Understand that amulet is part of thailand culture. I would like to pay a visit there and not sure on how to get there. I will be staying in Pratunam Park (between Phaya Thai Rd & Petchburi Rd), can you provide the transportation mode of how to get to the amulet market. Likewise, the charges require for each transport mode to get there. The amulet market is near the Grand Palace in Bangkok, as to how to get to it I do not remember, but I do believe it is west of the Palace. The Lonely Planet guide should have better directions, don’t expect local Thais to understand you if you ask them. As for how much it would cost to get there you best option is to take a Meter Taxi, just make sure they don’t charge you the inflated flat rate. Always make sure they use the meter.